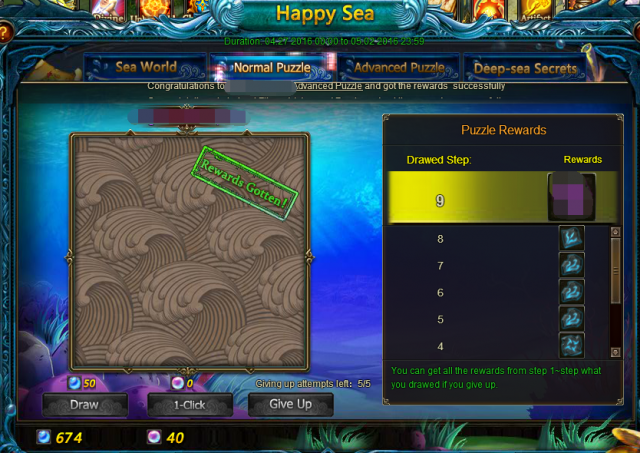 Welcome to the brand new Happy Sea treasure hunting event. 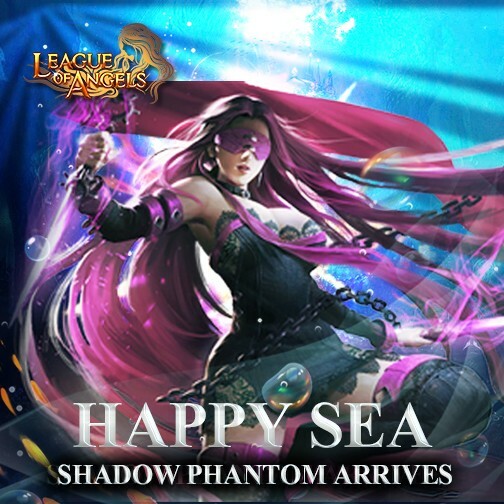 Enjoy the carnival and claim your rewards in League of Angels. 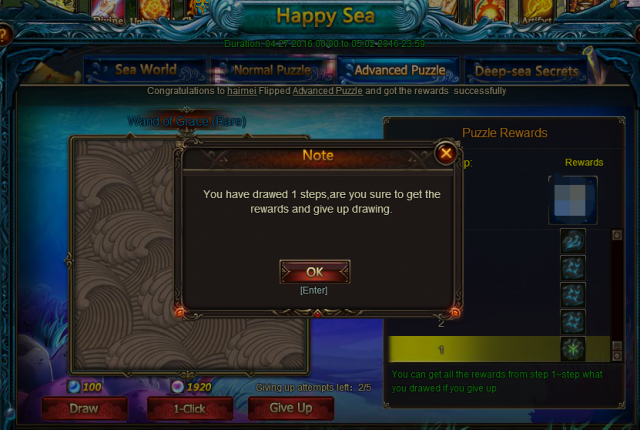 Our developers have optimized the Happy Sea event. Thank you all for your suggestions. 1.This time, Shadow Phantom(the new sylph) will show up here! 2. If you want to blitz in God's Trail, don't forget to take God's Trail Card from here! If you haven't finished your summer-beach-themed Homestead, Watermelon Juice, Volleyballs, Volleyball Net, Summer Theme Board, Seagull and more components are waiting for you here! If you haven't got Polar Bear, Azure Dragon, Scarlet Finch and Lizard yet, don't miss them out this time! 3.Flip the cards to gain Knight Emblem (10#) and Wand of Grace (Rare)! P.S. : The EXCLUSIVE Magic Mount Soul, which is useful in Stable Craftwork(the new system), will be available in Lucky Tree on May 27th(server time). Stay tuned for more details about Lucky Tree event! 1.Every player has ONE FREE ATTEMPT EVERY THREE HOURS to train bubbles every day. 2.There's one standard line to remind players of the bubbles that are close to their max training. 3.Players will get corresponding rewards after flipping one card in Puzzle. 4.Players can choose to give up flipping the cards. You can still claim the rewards from the current draws. 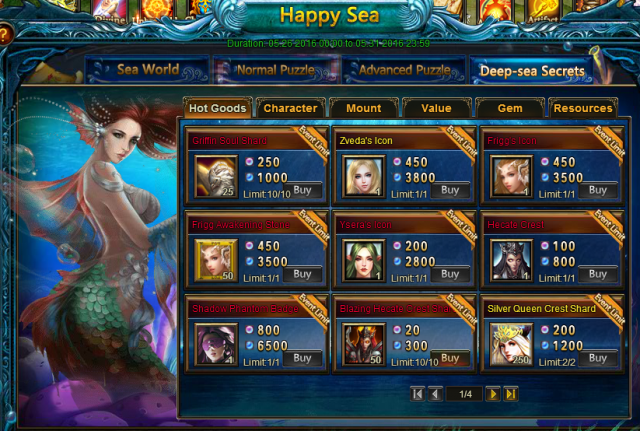 Happy Sea is made up of four parts: Sea World, Normal Puzzel, Advanced Puzzle and Deep-dea Secrets. 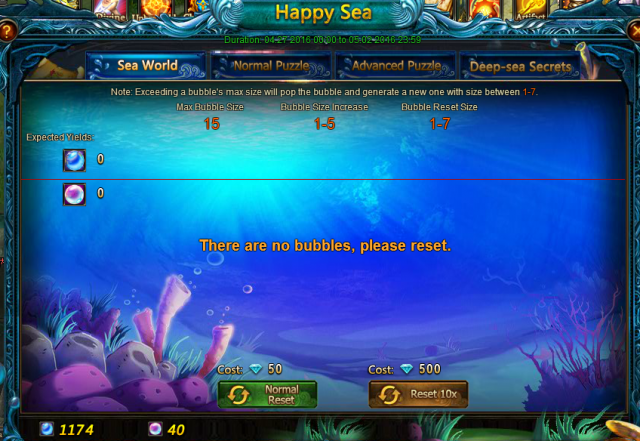 In Sea World, players train and collect bubbles, which will be of great use in searing for Seabed Treasure and Deep-sea Secrests. 1.Each bubble has an initial number on it (ranging from 1 to 7). 2.Every player has ONE FREE ATTEMPT EVERY THREE HOURS to train bubbles every day. 3.Common Bubbles and Colorfuls will appear randomly. Expected yields in the right corner show the total number of bubbles in the current panel. 4.Bubble's max training is 15. Attention: Exceeding this limit will break the bubble and generate a new one. Note: Please collect the bubbles in time. If you don't collect the bubble when it's in max training, you will probably only collet a much smaller number after it breaks. 5.1-Click Train enables you to train all bubbles into 15, without worrying about their exceeding max training. after training 7 times, it costs only 20 diamonds to 1-Click Train. 5. After collecting all bubbles, it costs 50 Diamonds to Normal Reset. Reset 10x to enter 10x mode, which means players will be able to collect 10 times the number of bubbles as normal. Use the bubbles you collect to flip the puzzle. 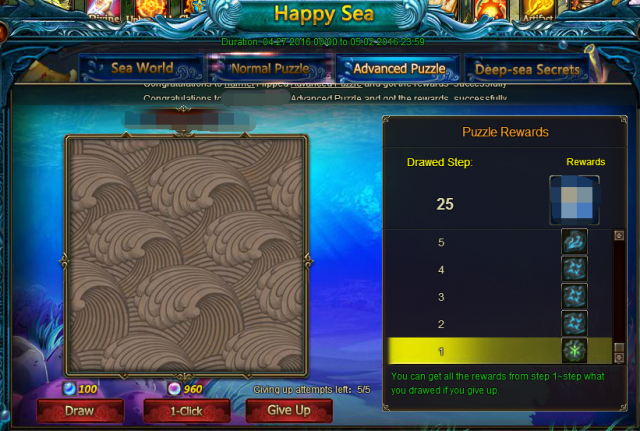 Normal Puzzle and Advanced Puzzle require different numbers of bubbles to open, since the rewards in Advanced Puzzle are better than that in Normal Puzzle. Note: Complete the puzzle to collect the rewards. You can also get responding rewards after filipping each card. Draw: Use Common Bubbles to flip one card at one time. 1-Click Open: Use Colorful Bubbles to flip all the cards in the puzzle. Players can choose to give up flipping the cards. You can still claim the rewards from the current draws. Angels, mounts, gorgeous fashion and more resources can be available here. This time Ysera, Skysoneg and Azure Dragon will be available here. Please note that the above screenshot is not the final version. For final version, please check in game. Two kinds of bubbles are available: Common Bubble and Colorful Bubble. 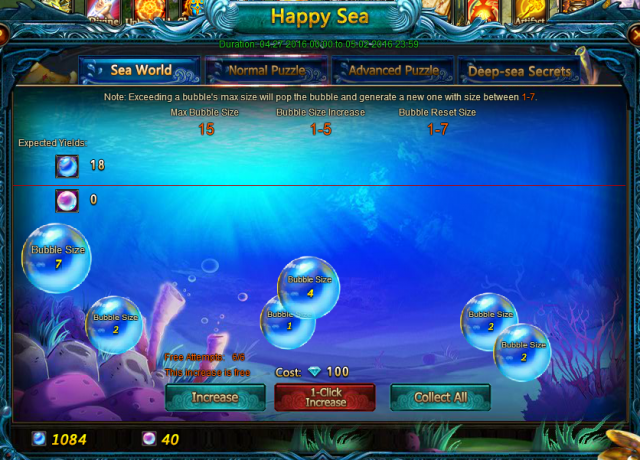 Bubbles can be used to flip in Puzzle and buy rewards in Deep-sea Secrets. More exciting events are coming up through May 20 to May. 28 (Server Time), check them out in the in-game Hot Events menu now!